I mean, maybe you can a little. But it’s not going to come easily. You have to plan ahead and let a lot of things go. Even then, summer is just plain hard for working parents. I was reading an article in the NY Times the other day about the families who can’t afford summer and even though we are very fortunate to have someone at home during the week (me) I still have to work and it’s not exactly playtime all day. Except it is for the kids. We kicked off summer with a nice long weekend in Washington, DC. It was in many ways, a perfect trip and I’ll be sharing more about it in the next couple of weeks. It was our one and only vacation planned for summer and we lived it up and had a blast. Now we are home and I’ve spent the week trying to juggle your typical vacation letdown with a long to-do list from work and two very bored children. To be clear, I am ok with bored children. But the truth is that bored children talk. They ask questions. They argue. They work it out. All within about 10 feet of mom who is supposed to be working. In early March, I planned activities and camps for the boys to experience this summer. I left lots of free days so they aren’t scheduled to the max and I worked up a schedule for all of us. It took me a lot of time and it isn’t cheap. And then each boy had one of their camps cancel on 3 different weeks so I am scrambling at the last minute. My solution will be to get up early or squeeze in work during 2 hours of allotted childcare time at my local gym. I was able to add Calvin to another camp for one week at the last minute. But it cost more than the first one. This is the reality for many work-from-home parents but what’s worse is that it also happens to those who have to show up to an office every day. How in the world do parents who work outside the home handle this? Parents who can’t afford to pay more when plans they worked hard to make months early are canceled outside of their control? It’s utterly ridiculous. It’s a broken system that hurts everyone and while my inconvenience is low on the totem pole of hardships, this taste of annoyance this summer makes me hurt for all the moms and dads who have no easy answers. For many parents, scaling back on other responsibilities during the summer simply is not an option. I think most of us are realistic about the fact that summer is not what it once was, yet we still have this pull to embrace bare feet and running in sprinklers all day. My boys see me working now. They hear me say “just a minute” many times a day and they are learning about what I do when they are usually at school. Honestly, I don’t like it. I don’t want to make them wait and I push down guilt more times a day than I can count. I’ll never stop wanting to be in all the places at once and that is just what I have to deal with. I’m grateful to be in a job that is flexible. I love and want to be present with my children. I love to write and create. But I can’t do it all at the same time. I wish I had answers for all the working parents this summer, but I don’t. What I can do is tell you how I am going to fight for my sanity as a work-at-home mom and hope for the best. Maybe some of these tips will help you too. You know what I am talking about. During the year, you think ok I need to work this much and get xyz things done. You have great intentions and before you know it you’re in the workday slide. Suddenly your 4-hours of work becomes 6 or 8 or whatever and you realize you haven’t moved since lunch. This is not going to work in summer. I’m not saying you can even begin to set a consistent summer schedule, but you can do it weekly. Every weekend, look at your calendar and decide your office hours for the week. Then, and this is the tricky part, stick to them. Don’t try to “do this one thing real quick” outside of your hours. Don’t do it. DON’T! That tomfoolery is for days when you have time to spare (ha). Summer has none of that for you. Walk on. Whatever your workweek looks like, make sure you have at least one real day off. You know, like in the Bible. 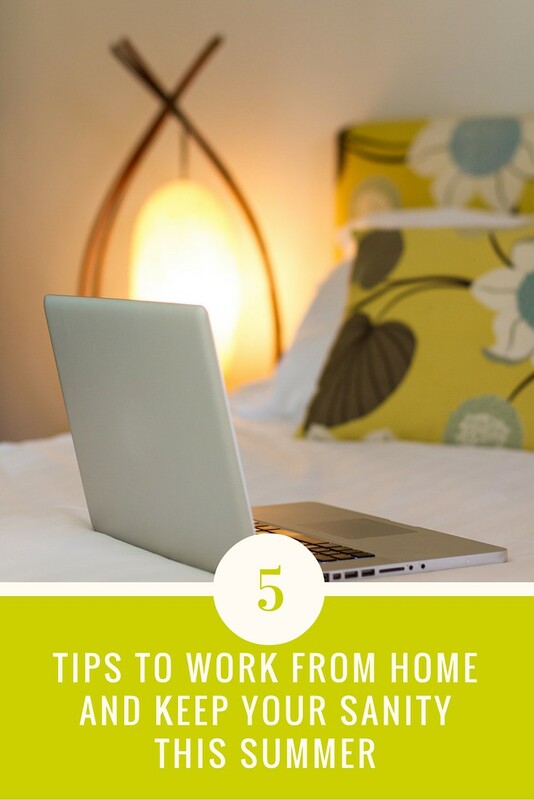 This is always important but even more so when you work-from-home and everything tends to bleed together. Have one day each week that is fun. Go out to eat as a family, take a nice long hike, see a movie, whatever. Have one real day that you can call your own and make sure you enjoy it. This is NOT the day to catch up on all that cleaning. Don’t even come here with that life. This one means to get your sleep. It’s probably the easiest and hardest lesson to learn, but sleep is so much more important than most of us realize. Even those of us who are masters of Googling fancy articles that make us feel smart at 4am (ahem). Don’t do that. Kick the phone out of your bedroom for the summer. Skip the evening TV for a few weeks. See what happens. My kids are young enough that they still have snack-time and I prepare most of their meals. I like to cook but summer is not going to be about trying new and time-consuming recipes. Basic, easy, no-pressure meals during the week are a must. If we get bored then we can go out or make a special meal on our fun weekend day. Remember, we can’t be all things at all times. Choose your moments. It’s not always easy but I have to remember how lucky we are. Yes yes, I’m getting all hashtag blessed now, but it’s true. As a work-at-home parent, I struggle but I am here with my kids. I love that and having that option is why I work so hard. I don’t want to forget it, even on the most stressful days. At the beginning of the year, we started a gratitude jar as a family and over the months we have been dropping in a note of thanks here and there. It’s something we’re not that consistent about and I think that summer is a great time to bring it down off the shelf as a reminder to be grateful for the wins, however big or small they are. Summers aren’t what they used to be, but we can do this. It’s going to take effort and intentionality, but I can do it. You can do it. One day at a time. How are you doing with this summer thing? Share your tips in the comments below! I’m glad I found this post on Pinterest! This will be my first summer working from home with my 6 year old twin daughters. I won’t be working full time, which is a blessing, and I’m so excited to finally be home for a summer…but I know that part of my time will be work time! We also live in an area where summer camps are outrageously priced. I plan to put them in one for 1-2 weeks just so they can have some super active kid time, but other than that I am just hoping to find a reasonable mom’s day out program or something to have a handful of hours each week sans kids. But I am also so excited to do those summery things…we don’t have to give up on the golden olden days of summer, we just have to make it work! Thanks so much for stopping by! Summer is definitely the season of creativity for working parents! Wishing you the best and enjoy!